We don’t want to strike, but we will if we have to! In March, nurses across New York City at Mount Sinai, Montefiore and Presbyterian voted overwhelmingly to authorize a strike - 8,533 Yes to 230 No. An overwhelming margin of 97%. We do not wish to strike; we wish to negotiate a fair contract for our patients, for ourselves, and for our families. But our hospitals have made absolutely no meaningful proposals for settlement after many months. Our #1 issue is Safe Staffing. We need minimum staffing ratios in order to give good care to our patients. Our hospitals have repeatedly tried to silence our voices on the need for safe staffing. We won’t be silent any longer. If we have to strike, know that we are striking for you - New York City. We work at some of the largest and well-funded hospitals in the world. 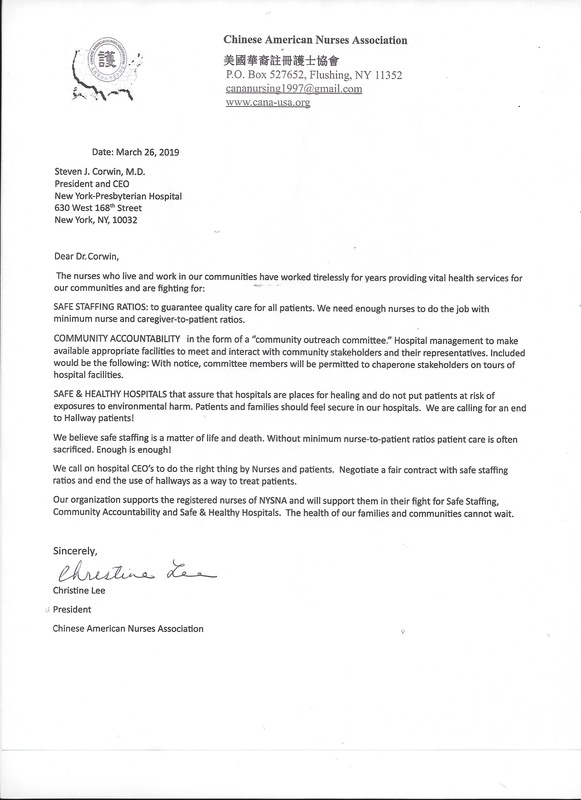 There is absolutely no reason these hospitals cannot raise the standard of care for the people of New York. That is precisely what we are fighting for - to Deliver the Healthcare that New Yorkers Deserve. Anthony Andrews, District Leader 32nd A.D.
Hudson River Community Association of Northwest Yonkers, Inc.
New York State Professional Fire Fighters Association, Inc. Please fill out this form to show your support and sign up for updates from NYSNA’s negotiating committee. Do you or your organization want to donate financial support to nurses in the event of a strike? Can we list your organization as a supporter of nurses in this struggle?